Depending on the number of trick-or-treaters in your house, there is a very good chance you are waking up this morning with more candy than you gave away last night. 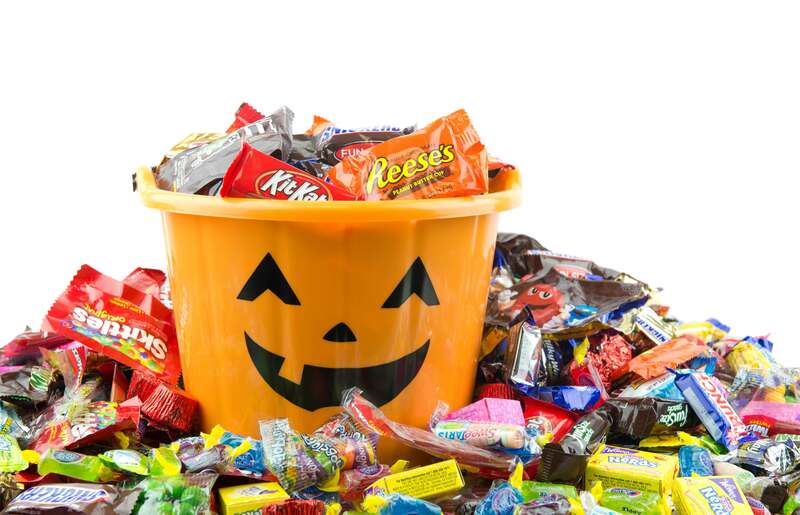 According to a survey by the National Retail Federation, consumers were expected to splurge this year on all things Halloween, and candy was no exception. It was estimated that $2.7 billion worth of candy was purchased for distribution last night. Even if you managed to give away all your sweet treats, it is almost guaranteed that you will find bowls of candy at the office this week to tempt you. Let’s just be honest- keeping your sweet tooth tame this week is going to be tough. Chances are, you are already well aware that too much sugar is bad for your health. But you may be wondering, how much candy can you eat before it is too much? Is there a healthier way to eat it? And how can you get rid of it without eating it all or throwing it away? In this blog, we will answer those questions. How Much Candy Can I Have? The American Heart Association (AHA) recommends no more than 6 teaspoons (24g) of added sugars per day for women and children age 2-18 years old; and no more than 9 teaspoons (36g) per day for men. For children under the age of two years, AHA recommends no added sugar in their diets. Added sugars include any sweetener that contains calories, such as table sugar, corn syrup, high fructose corn syrup, and molasses. Most kids and adults get 13-22 teaspoons of added sugars per day, which is 2-3 times more than the recommended limit. Here is what 6 tsp of sugar looks like when it comes to Halloween candy. Is there a healthier way to have candy? Be smart about it – read the label! Be good to yourself and know what you are putting in your body before you eat it. Check the nutrition facts panel for the serving size and sugar content. If there is no label available, use your smart device to check online for nutrition information. Drink a glass of water first and drink more water throughout the day. Being well hydrated helps curb cravings for sweets. If you are not a fan of water, try adding flavor boosters like mint and cucumber, lemon, strawberries or basil. Have it with a quality protein, fruit or vegetable. High sugar foods like candy, soda and other sweets raise blood sugar levels and insulin levels in a way that makes you feel worse and crave more sweets. Adding a good source of protein, like the peanut butter or lean meat, will help keep your blood sugar levels from rising and falling too quickly. Adding a fruit or vegetable will provide fiber and help balance out a high fat candy like chocolate. Have less sugar at your other meals and snacks. Be more intentional to choose minimally processed foods like lean meats, whole grains, fruits and vegetables for your meals and other snacks. Check for sugar in any processed foods you eat by reading the ingredient statement. There are many names for sugar like high fructose corn syrup, evaporated cane juice, dextrose, sucrose, and fruit juice concentrate. Keep in mind that many “healthy” foods like yogurt, ready to eat cereals, granola bars, sports drinks, peanut butter, ketchup, barbeque sauce, and whole grain breads may contain more sugar than you might think. Brush your teeth after a treat. High sugar foods like candy, desserts, sodas and juice attract bacteria to your teeth, which eat away at your teeth causing cavities. Rinse your mouth with water after meals and snacks and keep an extra toothbrush in your purse or desk. Soldier’s Angels Treats for Troops. Visit https://soldiersangels.org/TreatsForTroops.html for the closest drop off location near you. Visit http://www.halloweencandybuyback.com/ for the closest drop off location near you. Visit http://signup.operationgratitude.com/halloween-candy-give-back-map for the closest drop off location near you. Call your local church, homeless shelter, nursing home or food pantry and ask if they accept candy donations. Want more info on how to satisfy your sweet tooth without sabotaging your waistline? We offer confidential nutrition counseling with a registered dietitian at all of our clubs. To find out more or to make an appointment, click here. Pam Speich is the Director of Nutrition Services at American Family Fitness in Richmond, VA. She graduated from Carson Newman College with a B.S. Degree with Honors in Foods and Nutrition with an Emphasis in Dietetics. She completed her dietetic internship at Vanderbilt University Medical Center and earned the credentials Registered Dietitian (RD) in 2000. Pam’s experience includes clinical pediatrics, wellness research/writing, public speaking, nutrition counseling, wellness program development, sales and marketing, and food labeling including nutrition facts panels, ingredient statements and allergen declarations. Contact Pam to schedule a nutrition counseling appointment.